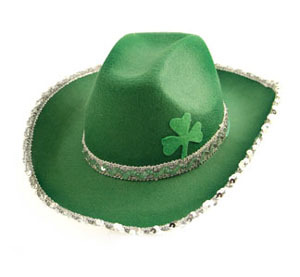 Being raised a Texan; St. Patrick’s Day wasn’t much. We gawked at Chicagoans turning their river green, marveled at the number of people in the New York parade and wore green to school so we wouldn’t get pinched. Of course I was boy crazy so I wore pink. Not that I don’t have Irish in my blood. My great-grandmother, Delia Dempsey, was born on a boat in the middle of the ocean. Her Irish parents were making the journey because of the potato famine. Guess that’s why I love starchy foods. Dearly Demented Mom, a true Bostonian, always gave a nod to St. Patrick’s Day. She served us Corned Beef and Cabbage. It’s as traditional in my house as the Thanksgiving bird. The Dancing Dog Ranch never fails to have a wee bit of Irish here. I guess in those single years, I did party a bit harder on this Americanized Irish Drinking Day. In Ireland, they just drink all the time, don’t they? Still, my Irish streak persists. I married a redhead and I look great in green. I simply don’t understand when this totally Irish holiday turned into such a big deal. When San Antonio starts dying the Riverwalk green, you know it’s out of control. Recently I saw an ad for a local bar whose big St. Patrick’s Day celebration includes a day of Country Western bands and a chili cook-off. A chili cook-off? I’m pretty sure Texans still don’t understand real Irish shenanigans. Okay, y’all, listen up. I’ve been to Wikipedia and I’m armed and dangerous. Here’s the Cliff Notes version. Patrick was Catholic, taught people about the Holy Trinity using the three leaves of a shamrock, the Pope made him a Saint in 1783 and that day everyone attended church. It was the end of the Irish lent so after the service, they all went drinking. Plus they wore shamrocks on their jackets, hence the wearing of the green. And from that, we’ve managed to turn this into an American holiday where everyone dies their dogs green, drinks a wee bit much, and eats chili. Where did the leprechaun and pot of gold go? Hold on, I’m getting to that. I went to my source – the totally non-Irish Very Best Friend explaining I still didn’t understand how celebrating a saint ended up with us drinking green beer. She went to her source – an Irish Pub Owner. Very Best Friends always have a pub owner in their pocket. He explained it this way, “Darlin’ it’s all about shenanigans. They occur at a hooley (get together) and when the Irish whisky starts to flow, the craic (talk) begins and that’s when the shenanigans (practical jokes) start.” Oh, Tall Texas Tales. I get it all, now. Evidently Hallmark must have come up with the leprechaun and pot of gold. Since this St. Patrick’s Day falls on a Saturday, I plan to head to town to get into the middle of some shenanigans. I might have some chili, I won’t touch the green beer and I’ll be armed with my best jokes. I might even dance a jig or two. But I won’t wear green – the pinching is just too much fun. Whatever way you decide to celebrate, have fun and be safe. Just remember, there’s a little Irish in all of us. Luckily, we Texans are full of frontier blarney.